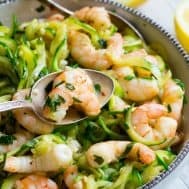 This paleo shrimp scampi is packed with flavor and perfect tossed with zucchini noodles! 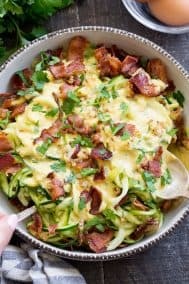 Prep your zoodles ahead of time for a quick, easy, and wildly delicious gluten-free, paleo, keto, and Whole30 compliant dinner that’s ready in just 20 minutes. 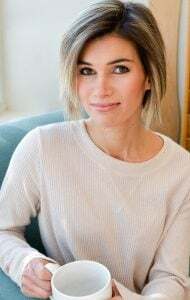 You know how your super picky kids who live on the same 2-3 foods at home will try/eat new foods when you’re not around? Adam and I were away for a full 24 hours about a month ago and my sister and brother in law took the kids to a hibachi grill for dinner. Hey, there’s always white rice if no one likes anything else, right?! Anyway, Drew, my pickiest eater even at the ripe old age of 7, tried shrimp that night – like actual non-breaded shrimp, and decided he LOVED it. I was skeptical, to say the least. The last thing I need is to buy a whole bunch of expensive shrimp, peel it and cook it, only to have it rejected in the end. Been there and done that many times – not a fan! 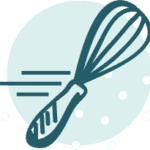 So, I figured instead of making it just for him, I’d create a recipe for the blog, and then let him try some and see what happens. So yes, that’s where the shrimp scampi comes in! 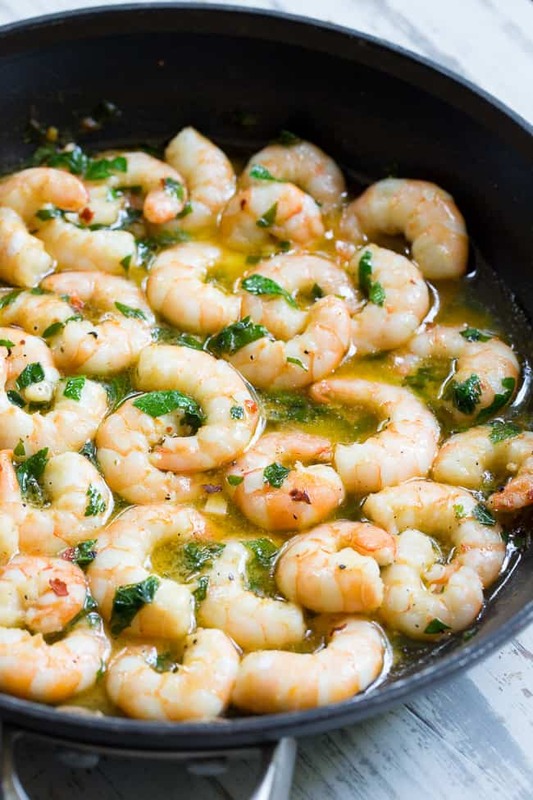 In truth, if you like shrimp at all you’re going to LOVE shrimp that’s buttery, garlicky and doused with lemon, don’t you think? It’s the best way to eat its in my opinion, so I’m thankful that the inspiration fell in my lap! Now when I think about shrimp scampi, I think about pasta (and bread too, just being honest!) so I knew some sort of noodles had to be in the picture here. I think zucchini noodles do the best here, but I can also see spaghetti squash fans going that way too. 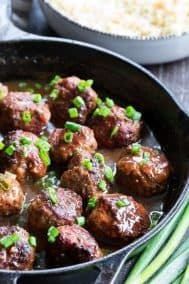 With both options, you’re also keeping it low carb, keto and Whole30 friendly as well! 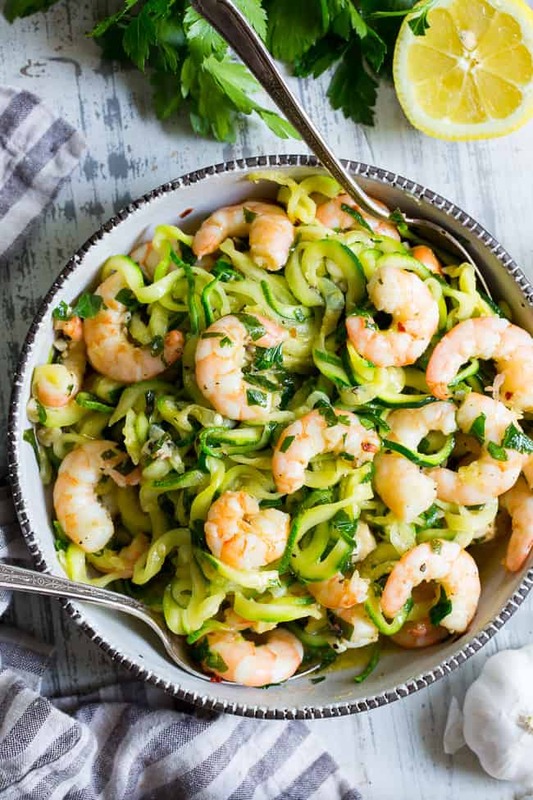 As always with zoodles, you’re going to want to “sweat” them thoroughly before cooking and tossing with the shrimp and sauce, since the sauce we have here is thin to begin with. 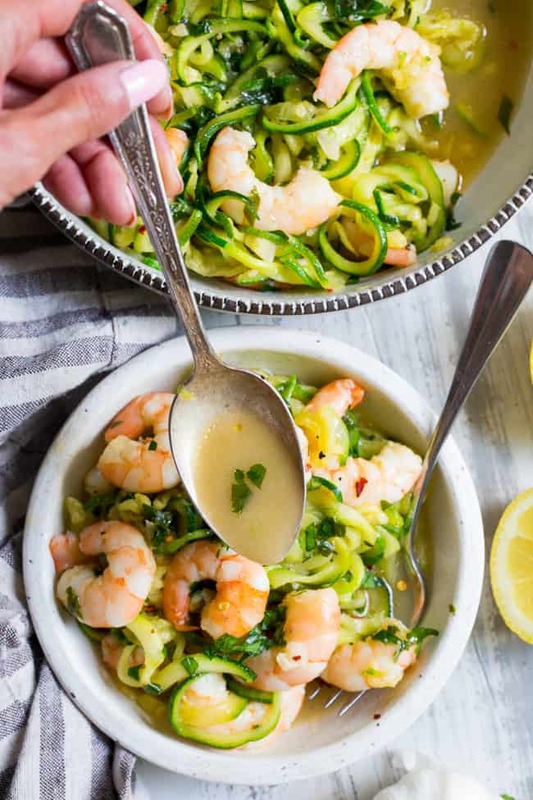 Don’t worry, sweating the zoodles isn’t difficult at all and actually requires no effort on your part – just salt the zoodles in a colander and allow them to do their thing. After about 30 minutes, you squeeze lots of water out and proceed! It really helps avoid those watery zoodles that drive everyone nuts. So, did he like the shrimp?! YES! As it turns out, Drew actually does like shrimp, although he’s definitely not a fan of zucchini yet! One thing at a time – I won’t be pushing that one anytime soon…maybe next time my sister baby-sits she’ll do a zucchini farm (haha) with them. I hope you’re ready for a super tasty, flavor packed dinner (or lunch!) 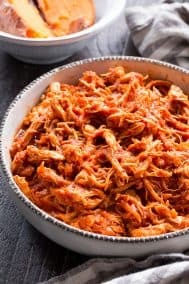 that’s quick to throw together (just sweat those zoodles ahead of time) and just happens to be gluten free, paleo, keto and Whole30 compliant. Okay, let’s get cooking! 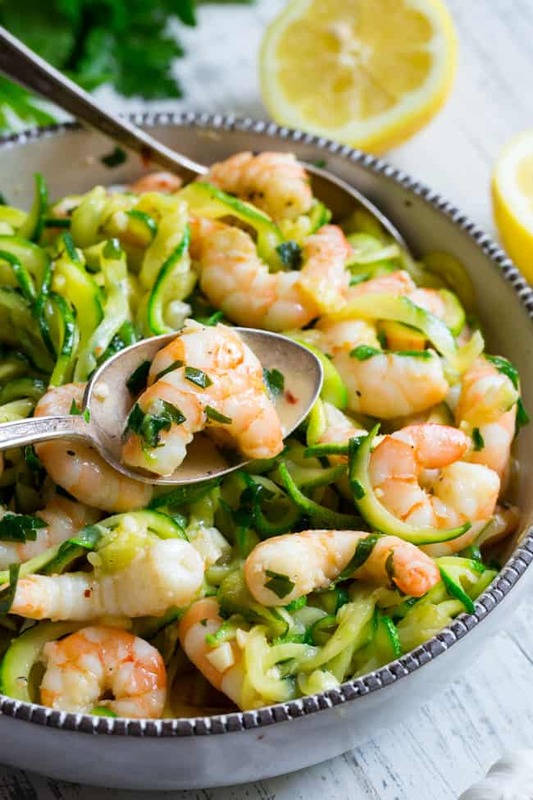 This paleo shrimp scampi is packed with flavor and perfect tossed with zucchini noodles! 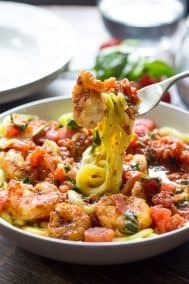 Prep your zoodles ahead of time for a quick, easy, and wildly delicious gluten-free, paleo, and Whole30 compliant dinner that's ready in just 20 minutes. 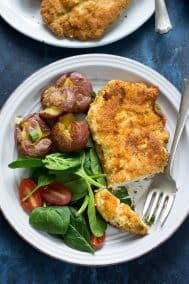 In a large skillet, melt the ghee or butter over medium heat. Add garlic and sauté until fragrant, about 30-60 seconds. minute. Add broth, salt, red pepper flakes and black pepper and bring to a simmer. Allow broth to reduce y about half, cooking for 2 minutes or so. Add shrimp and sauté until opaque and pink, about 3-4 minutes depending on size. After sweating zucchini noodles*, heat a large skillet over medium heat and add the olive oil. Sauté the zoodles, using tongs to stir for even cooking, about 2 minutes for “al dente”. 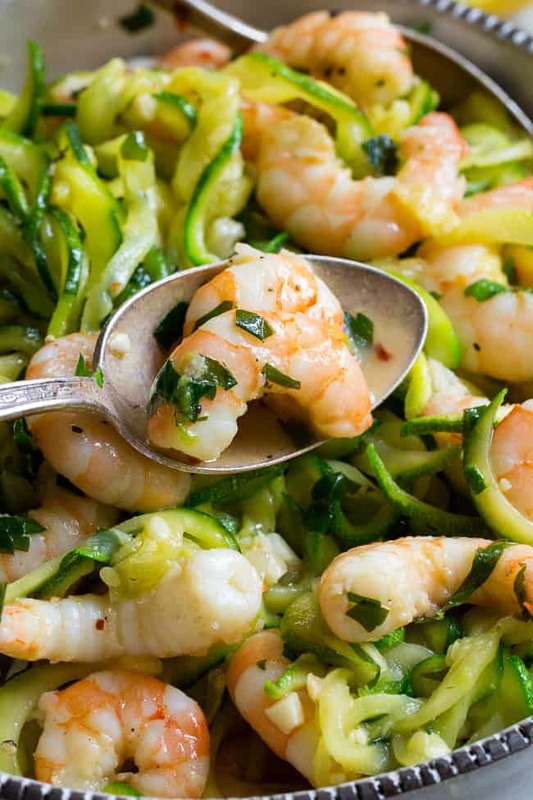 Toss with the shrimp scampi and serve immediately - enjoy! 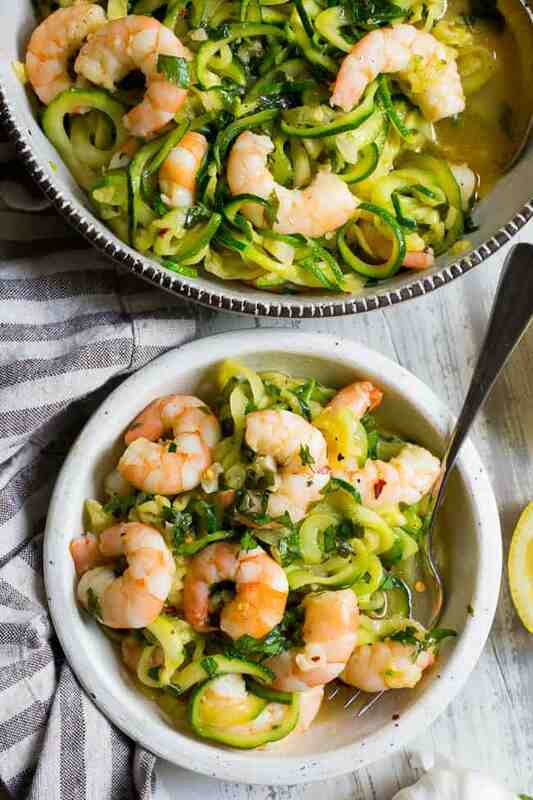 *To “sweat” the zucchini noodles, place it in a collander, then place the collander over a bowl. Sprinkle with the salt and allow it to sit that way for at least 20 minutes - the longer it sits, the more water is drawn out. After the 20 mins or longer, squeeze all the water out with paper towels. You’re now ready to cook your zoodles! 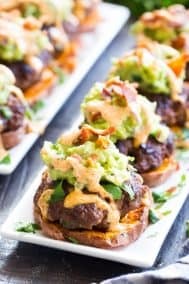 .amazing recipe. thanks. 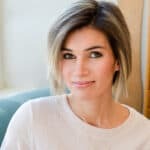 I will follow your blog. 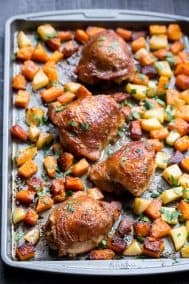 Thank you for this great recipe. I had never tried to eat zucchini like this. I loved how I could taste the lemon without having the acidity effect. I added small chicken breast pieces as well for those who don’t like shrimp in my family.